Hold Steady! Left-field Superstar Unleashes his Sensitive Side. I live in something of a bubble according to Son #2 ;as I thought Craig Finn was a lesser known member of Crowded House when I received this disc. Apparently he is the lead singer in a Beat-Combo called the Hold Steady who are popular among the young people. Who knew? So; with that in mind my review will actually be about the songs included on the record itself with no mentions of his other musical life, of which I know nothing. Listening with a completely open mind I was mildly thrilled with the opening track Maggie I’ve Been Searching For Our Son. The punchy atmospheric guitars, rhythm section and ultra-tight harmonies sound like they come from the best house band in LA; but it’s always Finn’s droll and worn voice that keeps me coming back to a deeply dark song. Even on the first listen through; it was evident Craig Finn is an exceptional songwriter. There’s a saying ‘The Devil is in the Detail’ and that is so very true of Finn’s observations in all of his stories. There’s a ‘pop sensibility’ weaving its way through every song; in a way not too dissimilar from bands like Cheap Trick and the Eurythmics; but it’s meant as a compliment because this band make even the saddest and loneliest of these songs very easy on the ear – I’m particularly thinking Newmyer’s Roof which echoes both Dylan and those two bands. One song in particular tickled my ‘musical funny bone.’ Going To a Show is one of the slower more acoustic tracks here and has the singer taking the role of a lonely gig-goer who has to tread through a sea of mediocrity while dreaming of seeing ‘the next big thing’ in a tiny club. Hmm; who does that remind me of? Finn’s supreme song-writing skills make every single song here stand head and shoulders above just about everything else I’ve heard this year (with the possible exception of Jason Isbell) with two songs that could and should be up there on the top table during the Awards season. Saint Peter (Upside Down) is truly extraordinary in the way Finn takes a Religious story and makes it about everyone of us who has betrayed someone close; either on purpose or accidentally. It doesn’t matter because that guilt will carry to the grave. The other that knocks me sideways every time I hear it is Sarah (Calling from a hotel). Wow! This is a heavy, heavy song worthy of Leonard Cohen. I won’t give the ‘punchline/ending’ away; but you gotta listen very closely from start to finish fishing for clues in the way you would a James Lee Burke or Ian Rankin thriller. Faith in the Future ends with I Was Doing Fine (Then Some People Died); a surprisingly upbeat song; combining hope, despair, loneliness and even faith itself in a way I’ve not heard since Steven Patrick Morrissey left the Smiths. Hmm; perhaps that’s who Craig Finn reminds me of – an American Morrissey. Perhaps. 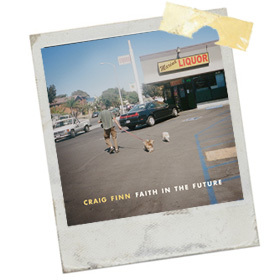 Hopefully Faith in The Future isn’t just a throwaway sideline for Craig Finn; nor do I want it to be an ‘instead of’ where his day job The Hold Steady is concerned; but a stepping stone for Finn’s own writing in whichever direction he decides to go.